Bourns CW105550A and CW161009A AEC-Q200 Chip Inductors are wound on a ceramic core that provides stable electrical characteristics over an extensive range of temperature and frequency. The CW161009A inductors are offered from 1.6nH to 390nH and CW105550A inductors from 1nH to 120nH. These inductors provide a high-quality factor (Q) and a high self-resonant frequency in an ultra-small size. 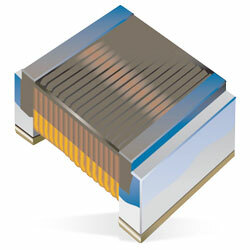 The chip inductors operate at -40C to 125C temperature range. These chip inductors are perfect for RF signal processing, resonant circuits, set-top boxes, tablets, cellular phones, and various mobile electronic devices.